Product Description: Small and sweet. 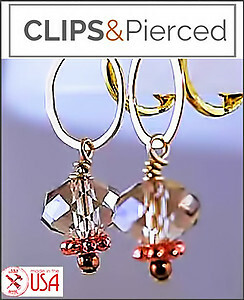 Champagne Crystals Earrings. Features: Enchantingly sweet and elegant, small rondelles crystals are dressed up with 14k gold filled components (hoops, seeds and wire) and a copper unexpected daisy for this elegant clip on earring. Simply gorgeous.